The Unfurling. Ni‘mah Ismail Nawwab. 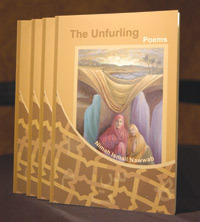 2004, Selwa Press, 0-9701157-9-2, $14.95 pb. Western readers with preconceived notions about what it means to be a woman in today’s Saudi Arabia will find this book an eye-opener. Those without preconceptions will find it a most pleasurable learning experience. Ni‘mah Nawwab, Saudi poet, essayist, editor and photographer, writes fluently in English, sharing in poetry her thoughts, her emotions, her important life experiences. When a flag is furled, it is rolled tightly against its staff; conversely, when it is unrolled, it takes the wind and flies. In the case of The Unfurling, a new book of poetry by Saudi writer Nimah Ismail Nawwab, what is heard is the too-often silent voice of the Arab woman. Nawwab has earned recognition as a writer of magazine articles—usually lengthy and detailed pieces of objective prose. In this latest effort, she demonstrates a penchant for subjective, short pieces filled with emotion and intellectual curiosity. The book is divided into three parts followed by a brief collection of short poems and haiku. Each part deals with a different level of human experience, from a woman trying to assert her individuality while maintaining both pride and reverence, to Islamic traditions, to an expression of her various roles as mother, wife, daughter and granddaughter. The book also discusses the global carnage and the restraints of societies and nations that use war, terrorism and intolerance to dim what ought to be a golden era in human history. In “The Longing,” the first poem of the collection, Nawwab examines the concepts of freedom and self-realization in the context of the Arabian Peninsula. The chapter is called “Awakenings,” and she focuses her feelings on a variety of topics from the abaya to poverty and the fears most people have of death. “Contours,” the book’s second chapter, is a celebration of her love of family, tradition and the region’s rich heritage. In the somewhat comical “Call to Prayer,” she describes the struggle of a modern family trying to get the children organized to go to the mosque and how to handle teenage issues. Grandparents and loved ones take a special place in this chapter, but Nawwab also writes about the clash of cultures and some of the less-pleasant family issues, including spouse abuse. The clash of Middle Eastern and Western cultures is further explores in the final chapter, called “Crossroads,” in which Nawwab expresses her views on recent events that have shattered the peace of the world—events that regrettably bring us the most frequent public views of Muslim women as agonizing widows and stunned mothers, grappling with the loss of children due to acts of war or terrorism. If the veil has served to muffle the voice of Muslim women, then “The Unfurling,” may be doubly precious as a reminder that this silence is produced neither by ignorance nor self absorption, but rather respect and reverence for long-standing cultural traditions. It is for that reason that Nawwab’s poetry will likely find its way into university classrooms—concentrating on Middle Eastern literature or women’s studies. It is also for that reason that people seeking to understand Muslim women (a number that will hopefully include Muslim men) will find a unique and articulate window to the soul in The Unfurling. Nimah Nawwab’s remarkable volume of poetry is a must-read for its artistic merits as well as its relevance and timeliness, as many ask, “Where are the moderate Muslim voices?” These insightful, profound and moving poems range across Arab and Muslim culture, the author’s life and experiences, addressing topics from religion, culture, faith, belief, gender, family, pluralism and peace to Palestine, Iraq, and Arabia. Her poetry reflects the faith, hopes, fears, disappointments, expectations and dreams of many ordinary Muslims, and indeed non-Muslims, today. This enriching volume moves us from personal experiences to current global issues. I highly recommend it to teachers, students, and those who are interested in Arab culture as seen through the eyes of a modern writer and poet. It looks at contemporary world issues, women’s issues, coming-of-age, and self-discovery. What a wonderful tool for dispelling stereotypes and replacing them with understanding – a means by which to explore our own journey of self-discovery. Here is the remarkable poetry of a Saudi woman, living deeply rooted in the Arab world, possessing the widest possible horizon of education and travel, writing in literary English and expressing a highly individualized consciousness that is both Arab and cosmopolitan, both Islamic and liberally humanist. Keep your eye on the emerging work of Nimah Nawwab! The gift of author Nimah Ismail Nawwab captures the flavor, the aroma of old and new Arabia and waft it enchantingly before us like frankincense or myrrh. So compelling is this poetic sensation, that we are drawn into captivating imagery that mysteriously transports us across the burning sands of time. It’s a magical journey replete with delightful rewards of vibrant, lifelike vistas – so absorbing, we may feel ourselves making the crossing as layers of culture pass before our eyes navigating realms of deep feeling, emotion, suffering, courage, love and hope embracing all humanity. Dear Nimah … I’ve read several of your poems … and I realized that you are an extraordinary person. You for sure possess genuine characteristics of a poet; a vigorous mind, a surprising knowledge of human nature … and an expression rich, various and abundant. My intention here is not to critique your work … but to appreciate the gift you have in knowing the language …your ability to see into the heart of things and deal with important unconscious material with such high sense and dynamic movement of the verse. In your “From Womb to Tomb”, you wrote … From womb to tomb, An entire nation is condemned. From womb to tomb, The oppressed cry for an end. Dear Nimah, … I can hardly express my feelings after reading those beautiful lines and if I’m to say something, I would say that … only a sensitive person with “unfettered essence” and heart is capable of creating such … lines. May god bless you and bless those whom you love the most. My best wishes .